The rapid rate of technological advancement in the past decade or so is nothing short of extraordinary. Cell phones have gone from clamshell offerings that were used for voice calls and awkward three letters per button texting to devices that can do everything from leveling pictures to filming HD movies. A media card the size of your fingernail can store millions of files, and you can check to see if you remembered to close your garage door while flying over the Grand Canyon. Automotive-based technologies have grown with equal intensity. The word “power” has never before been used as an adjective to the extent that it appears on new vehicle’s window sticker. Features like power steering, power door locks, power moonroof, power-adjustable seats and one-touch power windows are so common that we take them for granted. The rapid growth of technology is a gift for consumers. Expectations rise every year as standard equipment packages that were easily documented in a few sentences now take multiple pages to list. While some of the new technologies feel like gimmicks, others have stolen my heart. I will be the first to admit that my job as an automotive reviewer has spoiled me. I could live without any of the items on my list, but, with many of these items now found as standard equipment on relatively affordable vehicles, why not splurge? If they make my life easier and add a higher level of safety in the process, I can’t imagine why I wouldn’t want to include them on my next car, truck or SUV. Luckily, many used cars also offer today’s top tech features. 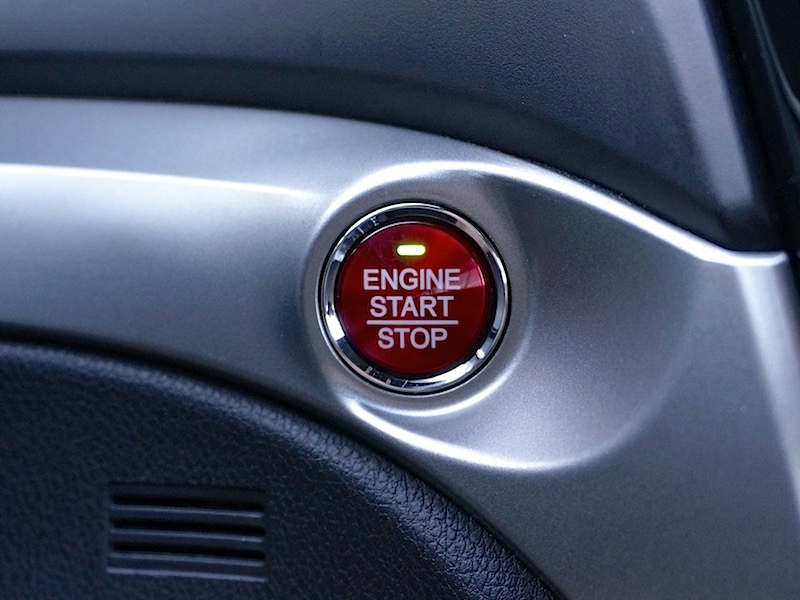 The first time I sat inside a vehicle with push-button start I actually wondered what to do with the key fob. I was so used to putting a key in the ignition that out of habit I tried to insert the little plastic box into the steering column. As the feature became more commonplace I began to enjoy the convenience of leaving the key in my pocket and simply hopping in the driver’s seat and pushing the start button. While it may not seem like a big deal, not having to fish through my jeans for a key has become a major help. 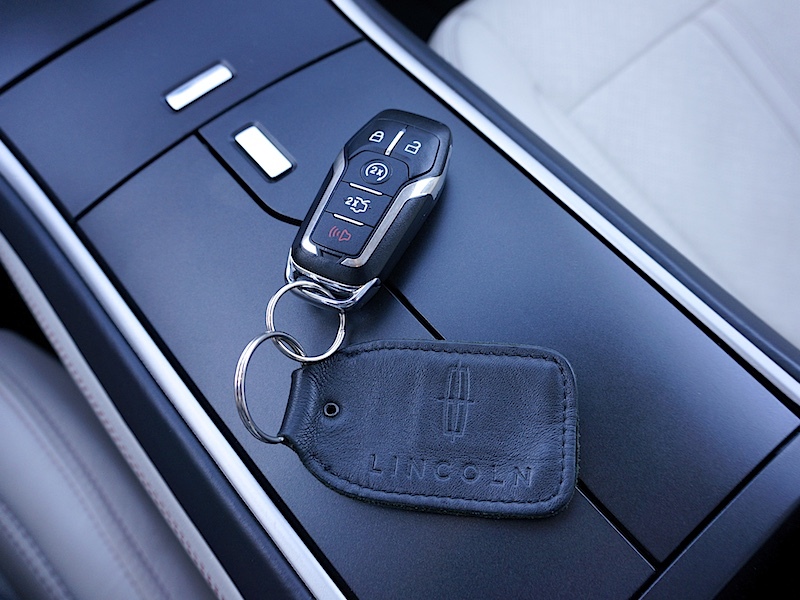 Being able to approach a vehicle that senses the key fob in my pocket and allows me to unlock the doors with a tiny button located on the door handle or trunk lid is a time-saver and incredible help, especially if I am carrying groceries or camera equipment. Some vehicles automatically unlock the door for you as you approach, adding yet another level of convenience. If you’re rolling your eyes, I understand. I mean how lazy am I? It’s a key. But drive a dozen cars where you can leave it in your backpack or hand bag and then jump into a vehicle where you need to dig it out and you’ll see why this often inexpensive option or standard feature is tops on my list. I am fairly certain that every driver has done it. You’re carried away talking with a friend, listening to the radio or focusing on the road ahead. Preparing to change lanes you take a quick look in the rearview mirrors and flip on your blinker only to hear a loud blast from the vehicle in the lane next to you. How did you miss a 5,000-pound SUV only feet from your driver’s seat? Where did they come from? Turns out they were always there in what is not-so-affectionately known as your vehicle’s blind spot. Blind spot monitoring or blind spot assist systems are fairly simple, using sensors located on the side or rear of the vehicle to alert the driver if a vehicle is hiding out of view. These blind spots are often located just to the rear of the driver on either side of the car. The system typically lights up a visual display located near the sideview mirror corresponding to the location of the unseen vehicle. Putting on your blinker or attempting to make a move that would cause an accident results in an audible warning and series of flashing light. There are certainly low-tech options like extra stick-on blind-spot mirrors or bringing along passengers that can help with their own audible warnings. But the system is so helpful, especially in vehicles that are notorious for poor rearward visibility. I would champion the inclusion of blind spot monitoring in every car, truck and SUV. Owners of many newer muscle cars and sports cars in particular would be well-served by the system. It wasn’t too long ago when the rearview camera arrived on the scene offering a new level of safety and security. Rearview cameras work by projecting the area near the rear bumper of a vehicle onto a screen inside the vehicle, which is typically in the center stack. Not only has the system saved countless abandoned suitcases, but many lives in the process. As of matter of fact, rearview cameras are so helpful that the National Highway Traffic Safety Administration (NHTSA) will require all vehicles weighing less than 10,000 pounds include them as standard equipment by May 1, 2018. Additionally, a number of vehicles already offer a standard backup camera. Vehicles equipped with adaptive or radar cruise control compliantly follow our infomercial hero’s advice. The driver simply has to set the cruise control and forget about it, while a sophisticated radar camera mounted somewhere on the front of the car lets the system accelerate and brake, keeping the vehicle a set distance from the car immediately ahead. Some adaptive cruise systems only work within certain speed parameters, shutting off when the car falls below a set speed. Others work all the way to a stop before requiring the driver to apply the throttle or reinitiate the system before they move again. Maybe it’s the fact that I grew up watching too many science fiction movies, but I love the convenience and show-off technology that radar cruise control offers. Long highway trips are less fatiguing, and having an extra set of eyes that are never weary keeping watch goes a long way to ease anxiety and stress. Bumper-to-bumper traffic that never quite stops is a breeze, you set the adaptive cruise parameters to the speed limit and the follow distance to the shortest setting and steer. I’ll never forget the first time I introduced radar cruise to a couple of friends. We were in a new Hyundai Genesis sedan riding along a lightly trafficked road in North Florida at night. I set the cruise control to 60 mph, the roads speed limit, and let the system do its magic. The Genesis slowed to about 45 mph as we approached a little slower moving traffic. About a half-mile down the road I spotted a traffic light that had just turned yellow. The car ahead began to slow down to stop at the light and the Hyundai followed along continually keeping that perfect, safe distance. The car just ahead stopped at the light and the Genesis applied the brakes coming to a nice, controlled stop about 15 feet from the car’s rear bumper. Everyone cheered. The technology is that cool and that effective. I debated on whether or not to even include the lowly USB port on my list. With the more exotic Bluetooth technology allowing phones and audio devices to wirelessly connect to the vehicles infotainment system and wirelessly stream phone calls or audio, USB seems a little archaic. But there are things that Bluetooth simply can’t do, like charge my smartphone. Yes, inexpensive adapters can be had that plug into the vehicle’s charging ports, which old folks like myself still call a cigarette lighter, but the usefulness of a USB port should make them standard equipment on every new vehicle, a practice that manufacturers like Kia have already adopted. Upping the USB formula, some manufacturers are offering more powerful USB outlets that are capable of charging larger tablets and other USB enabled equipment in shorter times. While many adapter technologies have come and gone, the USB port has only grown in favor. Many devices don’t even provide a way to plug into a standard wall outlet anymore, simply providing a basic USB connector in the packaging. 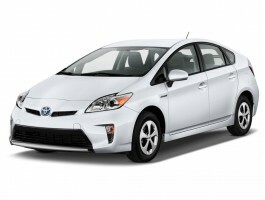 The 2013 Toyota Prius liftback is the latest edition of the quintessential hybrid-electric car. It's the fourth model year for the current shape, first launched in 2010, and it's now the centerpiece of a whole lineup of vehicles called Prius, including the Prius V wagon, the Prius C subcompact hatchback, and the Prius Plug-In Hybrid , which adds a larger battery pack that can be plugged into the wall to recharge to the classic Prius model. The plug-in Prius and the iconic standard Prius liftback are all but identical on the outside, with only a charging-port door on the right rear fender--and a handful of trim details--giving away the identity and the changes under the skin of the plug-in model. As it has for four years, the Prius liftback achieves the highest EPA combined rating for gas mileage of any car sold in the U.S.: 50 mpg (51 mpg city, 48 mpg highway). That combined rating, in fact, is equaled by only one other car--and that's the subcompact Prius C , which does better in the city test cycle (53 mpg) but worse on the highway (47 mpg). For the 2013 Toyota Prius liftback, the heart of its efficiency is the 1.8-liter four-cylinder engine and the Hybrid Synergy Drive system, which combines a pair of electric motor-generators into the electric equivalent of a continuously variable transmission. The motors can power the car on electricity alone (under light loads up to 30 mph), supplement the engine output with more torque, and of course recharge the battery under regenerative braking and on engine overrun. Total output of the powertrain is 134 horsepower, with a 0-to-60-mph time of just under 10 seconds. You'll get a lot of engine howl if you floor it, though, which tends to encourage more gentle driving for better efficiency. Toyota has more experience than any other maker in blending regenerative braking with the standard friction brakes, and the combination works flawlessly and imperceptibly under most circumstances. The standard Prius liftback can, at best, eke out a mile or so under all-electric power (you can test it by putting the car into "EV" mode, which runs only on electricity at lower speeds until the 1.4-kilowatt-hour nickel-metal-hydride battery pack is depleted. The Prius Plug-In Hybrid model swaps out that battery for a 4.2-kWh lithium-ion pack, which can be plugged into any wall socket to recharge in about 3 hours. Its usable energy is about three times greater, and the EPA rates it at 11 miles of electric range--though only 6 miles continuous, since the engine switches on to deliver the necessary power during part of an EPA test cycle. That points out the frustrating aspect to the plug-in Prius: Its electric motor is so minimally powered that under many different types of real-world driving, the car can't deliver the needed power electrically. So its engine will switch on even if there's plenty of energy left in the battery. Toyota engineers argue that this is how you deliver the highest overall fuel efficiency, but for drivers who want the car to travel electricity for those 11 miles, it's disconcerting for the engine to switch on under more than the gentlest acceleration. Electric acceleration onto short uphill freeway on-ramps? Forget it. Like all plug-in hybrids, the real-world blended gas mileage across both modes depends hugely on how often the car is plugged in, how it's used, and at what speeds and temperatures it's driven. The high roof and tail of the 2013 Prius shape contain a lot of interior volume: enough for the EPA to define it as a mid-size car. There's plenty of room for four adults, and five will fit with a bit of negotiation. Rear-seat legroom is boosted by hollowed-out front seat backs, though those seats have fairly skimpy padding. The split rear window, with a long, almost horizontal glass panel in the tailgate, and another vertical pane on the downturn, make the iconic Prius shape one of the most aerodynamic cars sold today--all in the aid of lowering drag at higher speeds to raise fuel economy. Inside, the 2013 Prius is starting to look dated. Not only are there swathes of textured hard plastics everywhere, but the instruments are split into two areas. Conventional gauges are in a hooded binnacle behind the steering wheel, and then there's the Multi-Information Display at the top of the dashboard and toward the base of the windshield--which seems increasingly incoherent and primitive compared to newer hybrids and even newer Prius models. It contains a seemingly random array of diagrams, icons, and numeric readouts, and it adds to the potential confusion for first-time drivers unused to the continuously variable engine speed--when the engine behavior (and hence its noise) is completely divorced from acceleration and road speed. 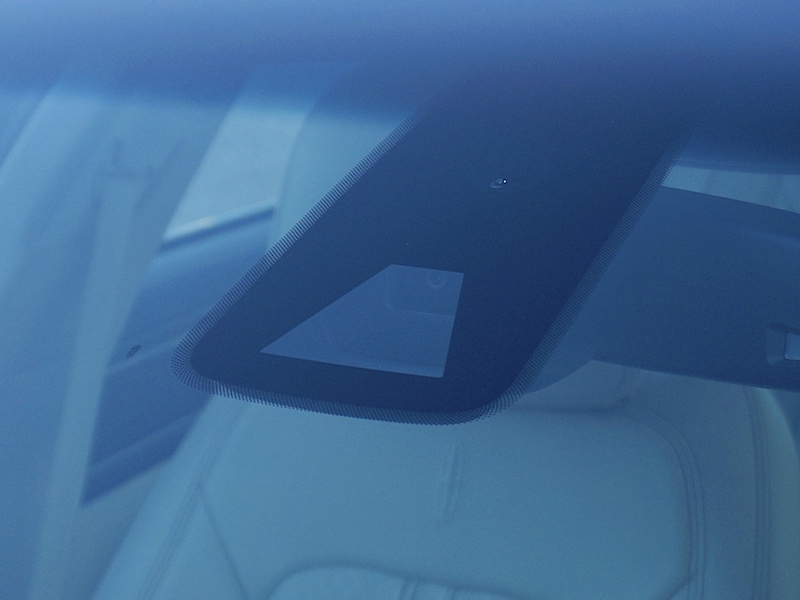 The other aspect of the interior that sets a Prius liftback apart from other cars is the "flying buttress" central console, which swoops down from the top of the dash at a shallow angle that makes it much higher than any other family car's console. This gives it enough space underneath for an awkward-to-reach storage bin, but taller drivers will find the hard-plastic console cuts uncomfortably into their knee room. Toyota's traditionally numb electric power steering is part of the Prius experience, along with handling than feels less capable than it actually is. The Prius actually responds fine to driver input, and corners capably; it just feels lifeless and numb through the steering wheel. Sports-car fans need not apply. Safety ratings are top-notch, however, and the Prius includes all the usual electronic safety systems and the usual quota of airbags. There's also the much-touted Intelligent Parking Assist system, which helps a driver parallel-park a Prius by controlling the steering wheel based on input from the car's cameras. Ford's system is better, frankly. As before, the 2013 Toyota Prius offers four trim levels, confusingly named Two, Three, Four, and Five. (There IS a very stripped-down base Prius One trim level, but you can't buy it; the car is only offered to commercial fleets.) With the addition of the Prius C at under $20,000 to anchor the low end of an expanded Prius range, even the lowest-level Prius Two and Prius Three trims now start in the mid-twenties. And it's possible to price a Prius well above $30,000 by adding either the solar moonroof--whose photovoltaic cells power ventilation fans to pull hot air out of the cockpit on warm days--or the Technology Package. Options include the Touch Tracer steering-wheel controls, one of the better implementations of pseudo-mouse technology we've seen on a car, along with things like LED headlamps, remote air conditioning, a navigation system, Bluetooth pairing, and more. For 2013, there's a new limited-edition Prius Persona Series model, with special paint colors, interior trim, and 17-inch alloy wheels. Breaking up is hard to do, especially if your “love” has four wheels. Yes, we Americans are infatuated with our rides, so much so that one-fourth of us give them names according to a seminal 2013 Nationwide Insurance survey. That attachment, however, can come with a steep financial cost, especially if your car is old, is in need of extortionate repairs or drinks fuel like a camel. If you need reasons to ditch your ride this Valentine’s Day, then read on. 1. You can’t catch a date. No girl will go out with you and that fact has absolutely nothing to do with the way you look, talk or flirt. What bothers her is your use of duct tape to hold up the rear bumper, patch a hole or to secure a faux hood scoop in place. Seriously?! Unless your car is spotless inside and out, it won’t matter to her how well you break it down to Uptown Funk. 2. You drive an unrestored classic. You call your car an unrestored classic, but everyone else says it is a wreck. Unless you plan to restore your 1987 Chevy El Camino, continuing to use it as your daily driver makes little sense. It’s time to get off the fence and restore your ride or sell it to someone who will. 3. Transmission slippage portends a major repair. Your car has gone through every warranty, including its powertrain, and now its extended warranty. When you step on the gas, you notice a delay in acceleration. Further, it takes multiple attempts to shift into reverse and there is an odd smell emanating from somewhere underneath the vehicle. Changing the transmission fluid might help matters, but if you’ve already done that, you’re looking at a major repair, one that could cost you more than what your vehicle is worth. 4. Engine problems are ongoing and pervasive. Besides the transmission, the engine is the other most costly repair for vehicle owners. Even with normal wear and tear, an engine will eventually come to the end of its useful lifespan and need to be overhauled or replaced. And both options will cost you dearly. Among the signs of pervasive engine problems include: inordinate oil consumption, smoke emitting from the tailpipe, low oil pressure or compression, tapping or knocking sounds, and leaks. Unless you can rebuild the engine yourself, you’re looking at an exorbitant cost. 5. Your ride cannot pass inspection. Some states are stricter than others when it comes to emissions repairs. Lest you can secure a waiver for failing inspection, you must get your car repaired. Otherwise, you will have to park it until it you can afford that cost. And those repairs can be expensive. Indeed, if the catalytic converter is damaged, it will need to be replaced and that cost can top $1,000 with parts and labor. 6. Air conditioning is just another term for driving fast with the windows down. Repairing your car’s air conditioner may be one of your least expensive repairs, but it is only a slice of the under hood maintenance your car needs. New hoses, wiring, a battery, timing belt, cooling system and gaskets will eventually have to be replaced too, turning your ride into a money pit. Many newer cars come with zoned climate control and an allergy inhibiting cabin air filter, and none of the headaches of your old car. 7. Getting lost and lousy music choices are just no fun. Your car was built before GPS navigation systems were the norm, and your audio system has a broken CD system, no auxiliary input jack or a USB port. Most cars built within the past three years have comprehensive infotainment systems with audio, navigation, climate control and other features tied in with a central control panel. Today’s cars are veritable entertainment boxes on wheels, bringing in satellite radio, Pandora, Stitcher, accurate navigation, traffic and weather reports, and other features. And, yes, you can usually sync that system with your smartphone to extend its usefulness. 8. Safety features can save your life. Your car may have front airbags and anti-lock brakes, but you may be missing out on safety features that have become prevalent over the past five years. Nearly all cars now come equipped with front, front side and side curtain airbags. They may also have stability control, traction control, brake-force distribution, and brake assist. Moreover, you can now buy a car with adaptive cruise control, lane keep assist, lane departure warning and a host of other driver assistance features. The Insurance Institute for Highway Safety (IIHS) tests and grades today’s vehicles for crashworthiness as well as for crash avoidance and mitigation. Consider whether your current car provides the protection you and the ones you love deserve by checking those ratings. 9. Nothing beats that new car look, smell and feel. When was the last time you purchased a new car? Remember the look, smell and feel that stayed with it for the better part of a year? You don’t need a specific reason to buy new and your current ride doesn’t have to be the wreck we described earlier. There is something to be said about running your hands across the maple or redwood burl trim, adjusting the instrument panel to reflect the information you want, or syncing your entire music library with the car’s infotainment system. You’ve put up with your old ride longer than needed. It is time to sell, trade or donate your vehicle and shop for something new or gently used. Before you make the break with your driving past, find out what your current vehicle is worth. Add in a sizable down payment, explore your loan options, and begin to shop for a car. If you choose used, insist on a CARFAX Vehicle History Report. Then, have a mechanic independently verify the car’s condition. Yes, breaking up is hard to do, but your current ride’s problems may be enough for you to sever that emotional attachment. With the average price of a new car coming in somewhere above $32,000, consumers know that they’ll be making a significant financial outlay in a bid to acquire cars loaded with the latest technologies. These technologies include Bluetooth connectivity, adaptive cruise control, and backup cameras. Fortunately, a number of late-model used cars include these same features, enabling consumers to find cars that are more affordable. In a press release, Edmunds recently identified the top technologies of our time and when they became prevalent. We’ll explore this further by offering examples of used cars that come with these features. Also known as autonomous cruise control or radar cruise control, adaptive cruise control gives drivers a small taste of upcoming autonomous driving. Standard cruise control maintains your car’s speed at a preset level, while adaptive cruise control takes it one step further by adjusting your speed based on traffic conditions. For example, if you set your speed to 55 mph in a bid to match the posted speed, then standard cruise control will maintain that speed until you brake, cancel cruise control or step on the accelerator. With adaptive cruise control (ACC), that same 55 mph speed will automatically be overridden under certain conditions. For instance, if the car in front of you slows down, the radar system in your car will slow your car accordingly in a bid to maintain a safe distance between vehicles. In some cases it will apply the brakes and stop your car as needed. Typically, you can also adjust your following distance, maintaining 2-, 3- or 4-second intervals between you and the car in front of you as you drive. Edmunds research discovered the widespread use of ACC beginning in 2013, with that technology extending to about one-third of the vehicles sold that year. However, you can find it as far back as 2005 in the Acura RL, which included the feature in an optional Technology package. That package bundled ACC, collision mitigation braking and run-flat tires. In 2009, the Hyundai Genesis made its debut and came with smart cruise control, its own name for ACC. Rearview cameras will become standard equipment on all new models beginning in 2018. Edmunds discovered that more than half of new vehicles offered as far back as 2010 provide backup cameras as standard or optional equipment. Typically, such cameras are included with navigation systems, but they’re sometimes available as a standalone option. 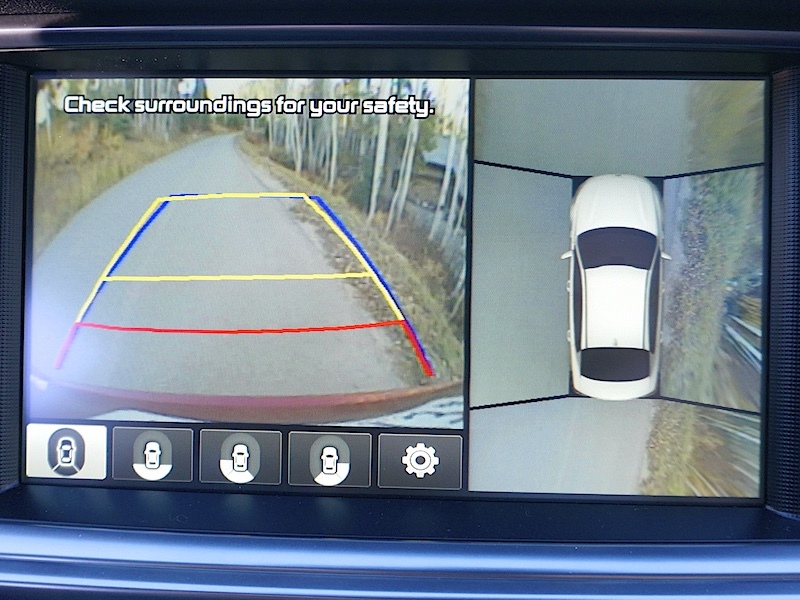 Backup cameras represent a safety feature that saves lives by helping drivers avoid accidents. When used, drivers can detect children, pets and objects that are behind the vehicle and avoid an accident. Some systems include grid lines while others add in parking sensors to help drivers gauge proximity to an object. While the technology for backup cameras has been around for decades, it wasn’t offered in production models until early in the millennium. Indeed, the 2002 Infiniti Q45 is outfitted with a rearview monitor, which was considered quite a novelty at that time. Among lower cost models, the 2014 Toyota Corolla offers an integrated backup camera across the model line except in the base L edition. Blind spot monitoring – known as BLIS or BSM, depending on the manufacturer – has been a godsend for some drivers. This system detects when a vehicle is riding in your blind spot — typically the area in your car astride the rear pillars. When a car approaches the blind spot, the system will inform the driver by activating a light in the appropriate sideview mirror or offer a warning on the dashboard, sometimes both. With such systems in place, drivers avoid the dreaded side swipes that occur when they change lanes, but are unaware that a car is in their path. Edmunds found that about one-third of 2013 model year vehicles have blind spot monitoring, typically included in a wider safety package. Beginning in 2010, the Ford Fusion Hybrid was available with this feature and cross traffic alert. From 2011 on, additional Lincoln and Ford models were similarly equipped. You can also find blind spot monitoring in 2011 Chrysler Town & Country models equipped with the SafetyTec package. Wireless technology is the rage and Bluetooth provides the connectivity that enables smartphones, tablets and personal computers to connect over short distances. In cars, Bluetooth wirelessly syncs your mobile device to the vehicle’s audio system. By 2009, Edmunds noted a sharp increase in the technology over the previous year, as 81 percent of 2009 vehicles provide Bluetooth as standard or optional equipment. Bluetooth was officially formed in 1998. By 2001, the first hands-free car kit and hands-free car kit with speech recognition was developed. In 2004, Chrysler became the first manufacturer to offer Bluetooth, including it in the Chrysler Pacifica crossover utility vehicle as well as in its Dodge Grand Caravan and Chrysler Town & Country minivans. The good news for used car shoppers is that just as USB ports and auxiliary input jacks are widespread in late model used cars, Bluetooth should be too. Edmunds also noted that dual-zone automatic climate control became commonplace in 2006, a feature that is typically found on higher trims of almost all new cars today. Navigation systems have been available for years, originally offered as plug-in systems and still available where in-dash systems are not. Tom Tom, Magellan and Garmin offer such systems. The first-ever GPS navigation system for a production car was placed in the 1995 Oldsmobile Eighty-Eight. Other technologies that are growing in popularity and will certainly become more widespread in coming years include heated and cooled seats, adaptive headlamps and in-car Internet, the latter more likely to be found in certain late model Fiat Chrysler and General Motors products. Certainly, new cars offer more choices when it comes to modern technologies, but many late-model used and certified pre-owned vehicles also have them. Typically, you’ll need to look at top trim levels or vehicles equipped with technology packages to find what you want. In many ways, our cars become an extension of our homes. We spend a lot of time in them and clutter can become an issue. Today’s vehicles often come with what appears to be plenty of storage. This becomes an invitation to put more in the car, however, rather than to stay organized. Here are some ideas that can help you keep your vehicle clutter-free, even with kids. Most of us have basic essentials we carry in our cars. These range from an extra blanket or two in the winter to a first aid kit and perhaps a 72-hour emergency kit. Roadside assistance items like jumper cables, a tow strap, flares, emergency triangles and other items also often float around in the trunk. You can begin your quest to organize by putting all of those items in their place. Things like emergency triangles, first aid kits, and the like can fit in the compartment with the spare tire, the jack or another ready-made cubby in the trunk. Or you can use shower caddies or small plastic tubs to put them all in one container (or two) and keep them out of the way. Inside your car, you likely have a few items like a cell phone charger, cords, or even a few flash storage cards of media. These are often just thrown into a center console or bin, making them difficult to find. A couple of small fishing tackle containers with three or four compartments under a latching plastic lid are ideal for those items to store without fuss. They’ll fit in most center armrest consoles as well. Some of the more obvious solutions are CD/DVD sleeve books, a “pocket protector” style pen holder for pens and tire gauges (a simple grade school pencil box can also work) and map sleeves to fit in your door pockets. These options are available at most grocery stores and auto parts stores. It never fails. You load your kids into the car, get everyone’s seat belts and safety seats buckled down, and are just merging onto the interstate when someone yells, “Mom! I’m hungry!” A difficult to reach bag of snacks or a passenger’s seat onto which several granola bars or grapes have been tossed doesn’t cut it. You need organization that both keeps the food clean and makes it easily accessible by someone who should be paying attention to the road. Here the flat fishing tackle box once again comes into play. 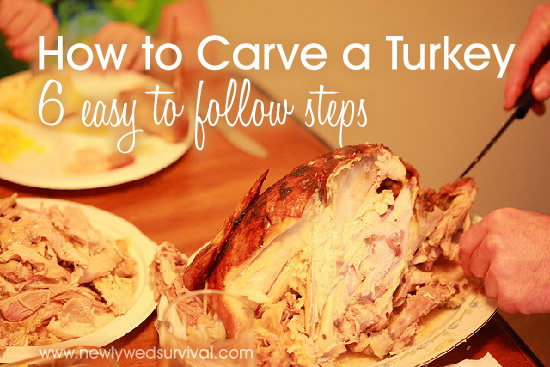 The smaller ones can be handed to your son or daughter without the need to take your hands off the wheel to open containers or serve up portions. Larger ones can be used by a front passenger to dole out snacks that are already prepared (and hopefully healthy) without fuss. The flat, square tackle boxes with little compartments and flat lids are perfect. They stack on one another, can be organized by snack type or child preferences, and can be left in the car if the snacks aren’t the type that spoil. What’s better is that they’re easy to clean and when they’re done, the kids can just drop them on the floor (which they’ll probably do anyway) and you don’t have to worry about carpets. For older kids that have more arm reach from their seats, you can make snack caddies that rest on the seatback or between children on the rear seat. These are self-serve and can be made from nothing more than tackle boxes or anything else that can be securely put in that space to hold food. As kids, my mom had an egg crate with Tupperware and bags of granola in it that did the job. Entertainment is the other thing kids want while on a drive. Perhaps staring out the window and making faces at passerby was enough for kids in the 1970s, but now kids expect full, immersive and immediate entertainment. We can blame the demise of the backward-facing rear seat for this. Or iPods. That still leaves the problem of keeping the kids busy without them getting into mischief back there as you drive. Again, we turn to caddies and storage options. Several stores sell “remote control holders” that velcro on or otherwise attach to an easy chair or couch’s arm. These also fit well beside child booster seats or can be set into seat back pockets like a horse’s saddle bag. Another option is a full-on seat back organizer. These are usually found in auto parts stores and truck stops. They are multi-pocket drapes that attach to the headrest or otherwise hang down the back of the front seats. They can be found in a variety of styles and types or you can make your own. You can try hanging a backpack from the front seat’s headrest (remove the headrest, loop the shoulder straps around the prongs, and re-insert them to put it back). This works well for older kids and can be quickly removed upon arrival if need be. Last but not least, we come to the inevitable garbage. Kids or not, we create refuse while driving our cars. Empty drink containers, food wrappers, unneeded receipts and all the rest. Often it ends up being tossed into an “out of sight, out of mind” spot and forgotten. There is a better way. One option is to put plastic grocery bags into an empty facial tissue box for easy access and dispensing. Just pull one out and put your garbage in and leave it on the floor or door side pocket. The next time you stop to fill the gas tank or run into the store, grab the bag and throw it away. Dedicated garbage containers are also a good option. Small garbage cans behind the passenger’s seat, a hanging garbage bag from the 12-volt outlet cover, or a garbage container in the glove box can work. How much garbage you generate in a few days’ driving should determine your solution. With a little thought and creativity, organizing your car is easy. Even with kids. Yet it goes a long way toward keeping things clean and avoiding embarrassment when the unexpected guest gets into the car. It happens every year. Several models depart from the market and are either replaced by an all-new vehicle with a different name or discontinued with no immediate plans for a replacement. As the transition to the 2016 model year moves forward, the following vehicles won’t see the new year. 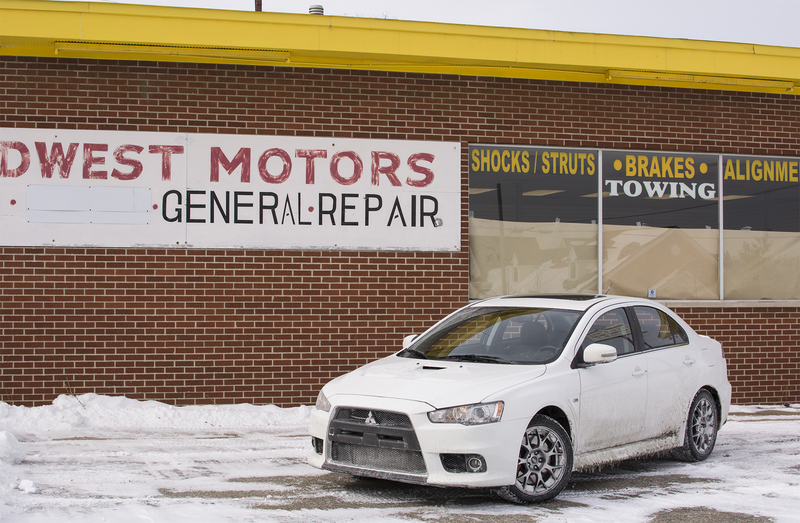 The Mitsubishi Lancer lives on for 2016, but its two most important all-wheel drive models are history. Mitsubishi gave the Lancer a facelift for 2016 and upgraded the content of its four standard trim levels, but this compact model loses its performance edge by canceling both the Lancer Evolution and Ralliart editions. The struggling Japanese automaker is also closing its lone North American manufacturing plant in Normal, Illinois, by year end. U.S. sales are up sharply this year, but a paucity of strong products does not bode well for the long term prospects of this brand. 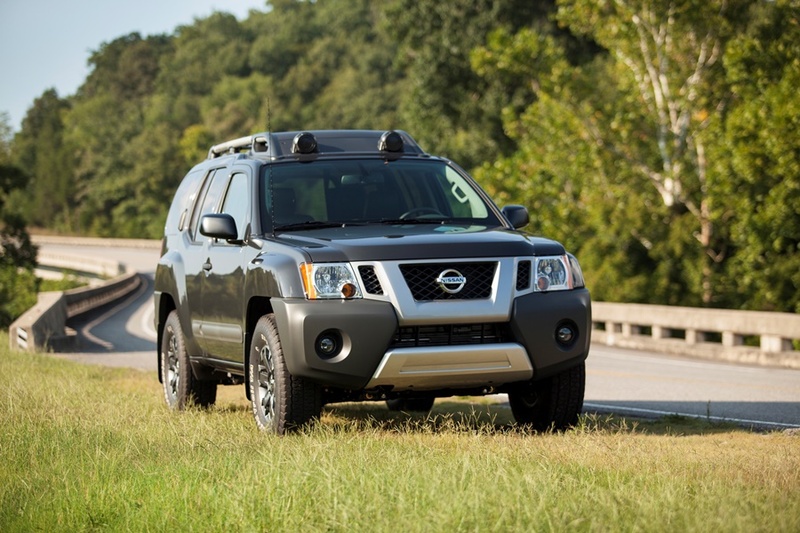 Yet another body-on-frame SUV bites the dust as the Nissan Xterra drives off into the sunset. This rugged SUV once had a strong following, but with few updates made and many other models to choose from, Nissan is giving it the axe. This news comes as Nissan readies the next generation Frontier, from which the Xterra was derived. Reportedly, Nissan didn’t want to pay the extra money to make a new Xterra structurally compliant to meet safety regulations. If you want a midsize traditional SUV, the Toyota 4Runner is the lone holdout. 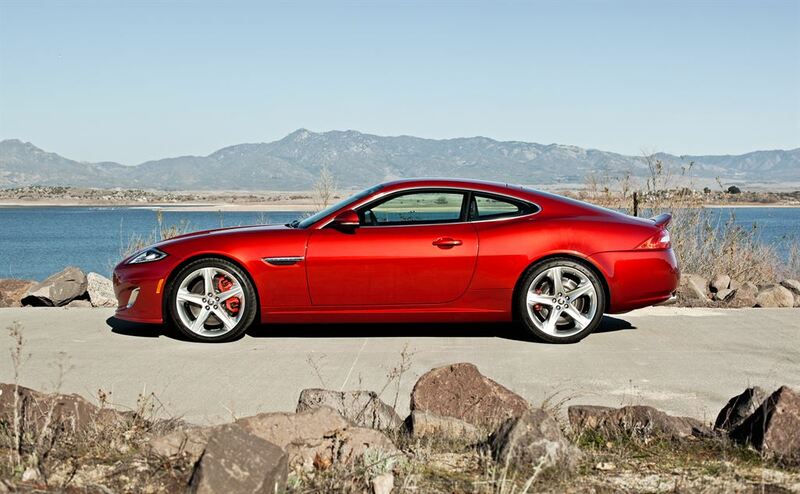 The Jaguar XK is gone, having shared the limelight briefly with the Jaguar F-Type. Quite frankly, there is no room in the Jaguar portfolio for this model as it readies its first SUV, the F-Pace and brings a compact sedan to the market in the XE. Rumor has it that a larger replacement for the XK is planned, based on a stretched version of the F-Type, but that model may be four or five years away. In all likelihood we’ll see a second SUV join the Jaguar lineup before we see the likes of a new XK-type model anytime soon. Like the Toyota Venza, the Honda Crosstour went against styling convention. Both models are based on each brand’s popular midsize sedans, with the Venza using the Toyota Camry as a platform and the Crosstour sharing its underpinnings with the Honda Accord. Toyota axed its Venza crossover earlier this year and now Honda will follow suit. With so many other choices on the market, these two quirky models will not be missed. As for a third quirky crossover, the Ford Flex still has some life left in it. 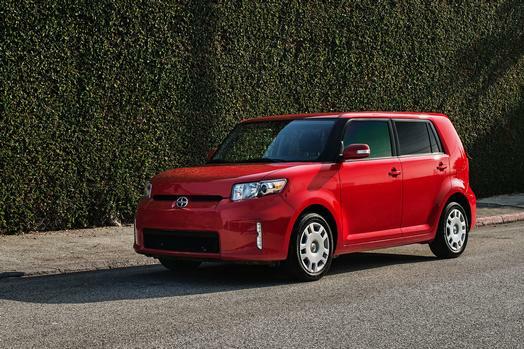 Fresh on the heels of the discontinued Scion iQ, the Scion xB has also been whacked. This boxy people mover defined the Scion brand early on and managed to make it through two generation product changes. Alas, Toyota has other plans for its youth-oriented brand, including the Scion iM hatchback, released along with the Scion iA sedan for 2016. Rumors are rampant that Scion will get a small crossover that’s based on the Toyota CH-R concept. Ah, naming conventions! Infiniti changed its model names for 2014, assigning a Q designation for its cars and QX for its SUVs. In 2014 it brought to the market an all-new Q50 sedan to replace the previous G37. However, Infiniti decided to keep the previous G37 and sell it alongside the current Q50. In 2015, the G37 was renamed the Q40. 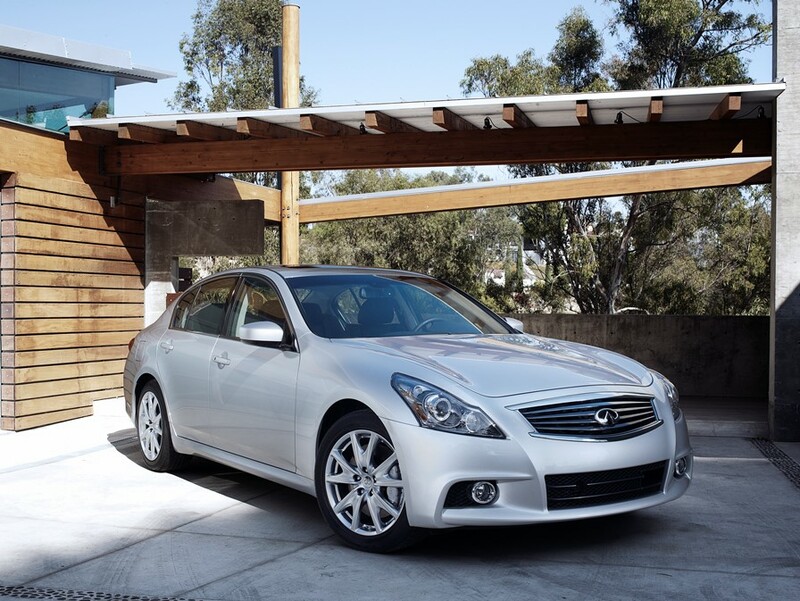 After only one year with its new name, the “old” G37 will not see the 2016 model year. Are you confused yet? No worries, an all-new Q30 will soon follow, which was conceived in a partnership Infiniti has with Mercedes-Benz. Among minivans, the Mazda5 is the best aligned of the batch. 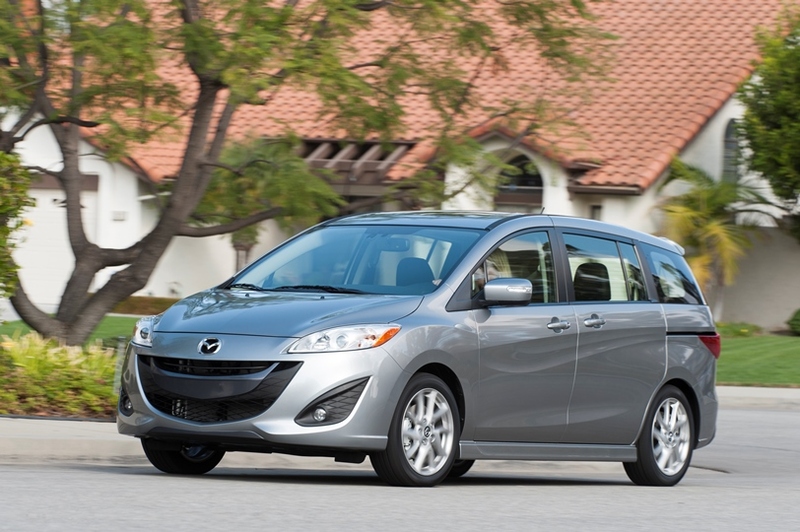 Each of the competing models are comparatively bloated and less “mini” van than the Mazda5. Mazda sells only 500 or 600 of its “5” models per month, but more than 10,000 Mazda crossover SUVs leave dealer lots month after month. Instead of sinking more cash in a money losing segment, Mazda has wisely placed its bets on SUVs. Good-bye, Mazda 5! And is that a new RX sports car we see following?! The Ford Flex is one of several threatened species or models, but it will survive for yet another model year. Expect the Chevrolet SS to last for about two more years as Holden production winds down. That also means the Chevrolet Caprice PPV will come to an end as well. However, General Motors may build an all-new rear-wheel drive model based on a modified version of the Cadillac CT6 platform, itself yielding a Buick variant based on the Avenir concept. New or used, there are certain things that every car should have beyond the basic expectations for reliability, safety and versatility. These are the creature comforts that make a car livable for the long-term, and many were costly extras or even non-existent just a few years ago. Now, you’ll find many of these listed as standard equipment. If you’re considering buying a new or used car, the first step is to make sure that it meets your expectations in terms of size, fuel economy and safety. After that, check to see if it has the following must-have features. If you live where the weather is cold at any given time of the year, few things are as welcome as a warm seat in a cold car. Some might say that remote start is a great option, but unless your windows are routinely covered in frost or ice, using remote start consumes fuel that can be saved by having heated seats. In most vehicles, heated seats warm up in two or three minutes after you start the car. Some infotainment systems, such as Chrysler’s Uconnect, allow you to set the heated seats and heated steering wheel to activate automatically with remote start or when the car is started. Cooled seating is a bonus item that is another consideration. Ventilated seats that blow air on your back or pull it through the seat to keep you cool during warmer months. Although some might say that if you need a backup camera you shouldn’t be driving, the fact is, they are a boon when it comes to safety in crowded parking lots. A backup camera is also helpful when backing out of a garage or maneuvering in and out of pedestrian and vehicle traffic zones from a parking space. Parking sensors, which usually activate when the car is traveling at low speeds or in reverse, can make getting in and out of tight spaces much easier. If you live or travel in areas that are crowded, a backup camera and parking sensors can be invaluable and a real bumper (and lawsuit) saver. Using your cell phone while driving is a bad idea. We’ve all heard the accident statistics and found out (sometimes the hard way) that using your cell phone while driving is illegal in many areas. Yet our busy lives demand that we’re able to keep up communications. What if you’re fighting traffic to get to a meeting and the phone call is to let you know it’s cancelled? Or you’re on your way home when the school calls because your child is sick? Hands-free systems, which usually use Bluetooth connectivity with your phone, are a great alternative to wearing a headset or otherwise using equipment you might forget. In most cars with a touch-screen infotainment system or center display (now almost a given in a newer car), your phone will pair with the system and display caller information. Many will even let you use voice commands to find phone book entries, make a call or send and receive text messages, which allows you to keep your hands on the wheel and your eyes on the road. From smartphones, to tablets and laptop computers, today’s world is festooned with gadgetry that needs to be charged. 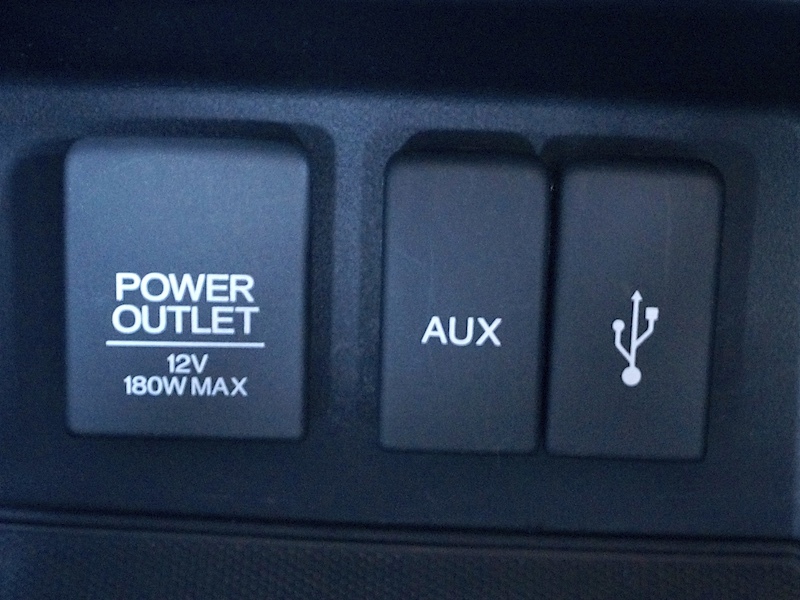 Most vehicles now have at least two or three 12-volt power ports. You know, the round ones we used to call cigarette lighters in less politically correct times. The lighters may be gone in all but a handful of expensive luxury cars, but the standardized 12-volt power outlet remains, and can be used to plug in everything from charging units to coffee mug warmers. Like outlets in your house, the more the merrier in your car. Having the ability to plug a device directly into USB ports, especially those which are hidden in center armrest consoles and glove boxes, is another great thing. Why the ones in cubbies? Because then you can leave your music player or GPS unit out of sight and plugged in. 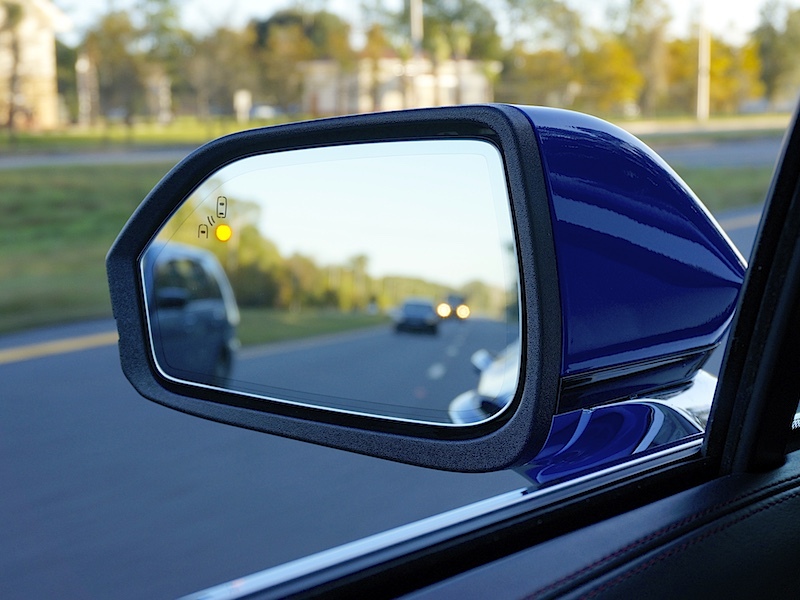 These days, nearly all vehicles come with rearview mirrors and sideview mirrors that adjust. Likewise, seating is usually at least moderately adjustable as well. The steering wheel, though, isn’t always. Getting a comfortable driver’s position, be it permanently or temporarily, is a must. Sometimes, adjustments have to be made due to changes in your shoes (maybe you need more or less space with high heels, boots or sandals) and sometimes, the steering wheel needs to tilt or telescope so that you can find the best driving position. Adjustable seating is very important and nearly all vehicles have at least four to six adjustments possible for the driver. 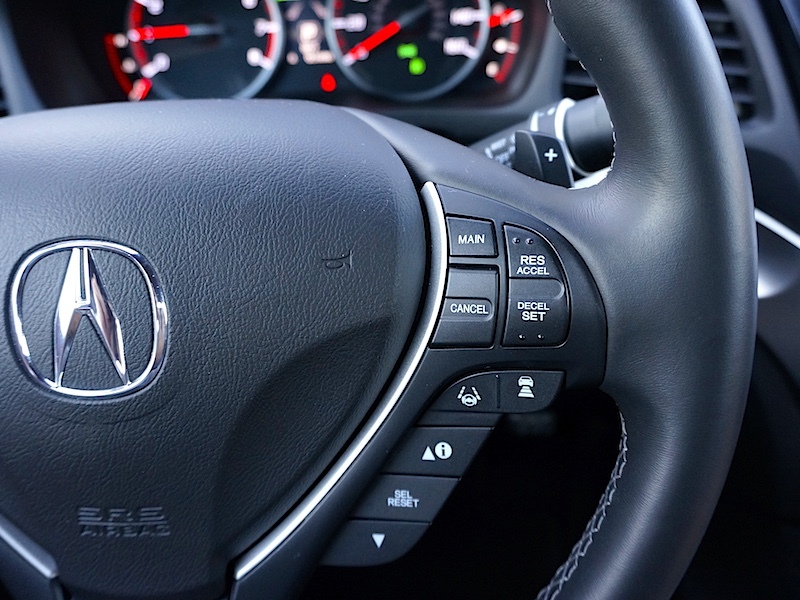 A tilt-and-telescoping steering wheel, however, is still optional on some cars. Until you don’t have one, you have no idea how much a tilt-and-telescoping steering wheel can help boost comfort in a car.